Biography: The Korean Symphony Orchestra was founded in March 1985 as a private orchestra by its conductor Yun Taik Hong. About 90 concerts – regular concerts, Youth concerts, Opera- and Ballet-performances as well as local area concert-tours and other special concerts – were played annual. In 1987 Korean Symphony Orchestra signed an exclusive agreement with the National Theatre. Now the orchestra became partner of the National Opera, the National Ballet and the National Choir, and two years later it was approved as a corporation of the Ministry of Culture and Sports. In March 2001, when the Seoul Arts Centre at its 16th anniversary got a new status as a foundation the new company took the Korean Symphony Orchestra as its permanent orchestra. Now the orchestra has about 80 members and is one of the “top three”orchestras in Seoul. The schedule is as pretentious as ambitious. Different Concerts alternate with Operas and Ballets and demand an extensive repertoire for every musician.In 1990 it performed the largest musical event ever held in Korea “The Grand Choir” with more than 5,000 chorists participating in chorus at Jamsil Gymnasium. It also realized more than 50 records and accompanied world famous singers as “Placido Domingo” in 1995, 2009 “José Carreras” in 1999 and 2005 and the “Three Great Tenors’ Concert in Korea” in 2001. “Dame Gwyneth Jones” in 2003. 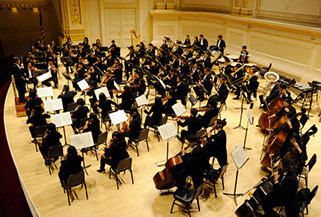 The Korean Symphony Orchestra has contributed to the development of classical music in Korea by its sphere activities. Going through many difficulties over the years, it has proved that a private orchestra can reach highest level of quality and so give an example for other private orchestras. The orchestra achieved a remarkable standard not only under musical aspects but also with a view on administration and operation of a professional orchestra.